SPAR Italy Partner, Aspiag Service, has donated the sum of €100,000 towards the replanting of forests destroyed by heavy storms. A fundraising campaign ran in all DESPAR, EUROSPAR and INTERSPAR stores in the Veneto region raised €60,000, whilst the remaining €40,000 was made as a direct donation by the SPAR Partner. 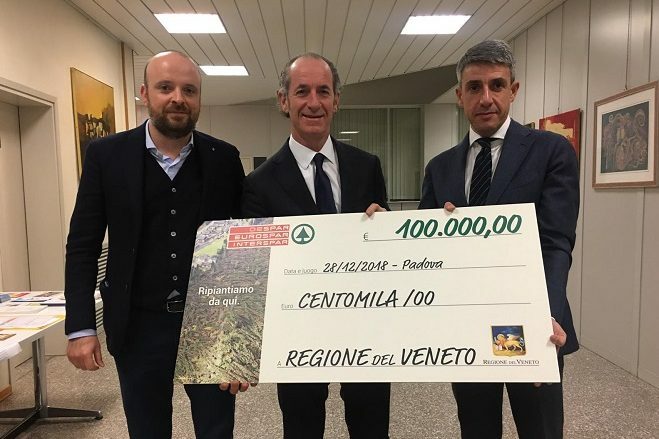 The fundraising campaign – Replanting Starts Here – ran in the month of November with the aim of supporting the Veneto region’s local government in replanting the mountain forests destroyed by extreme weather conditions in late October, last year. Aspiag’s Managing Director, Arcangelo Francesco Montalvo, and Marketing Director, Fabio Donà, handed over the donation to the President of the Veneto region, Luca Zaia.